I can’t remember where I found it or who wrote it, but these few simple lines make me smile every time I read them. 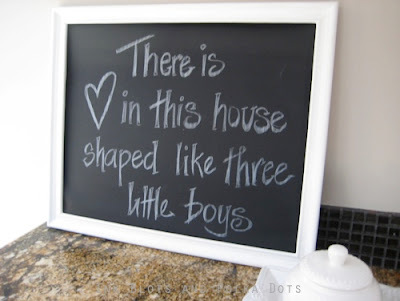 They also serve as a constant reminder of how truly blessed and thankful I am to have my little boys. I wanted to put this quote up in the mudroom for a while now, but was at a loss as to how I should go about it. Vinyl wall letters were too expensive and briefly I considered going the subway art route that is so popular these days, but the message is so simple that I didn’t want it to get lost in the typefonts. 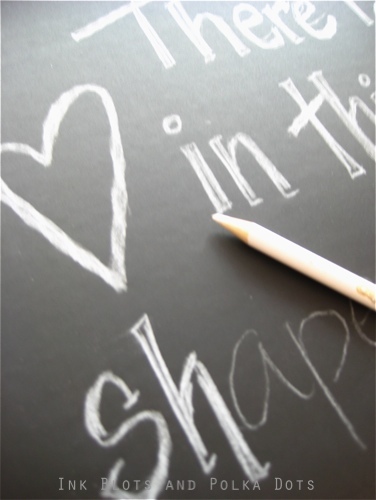 I happened upon this blackboard sticky paper for a dollar at the dollar store and knew right away that it was the perfect medium! 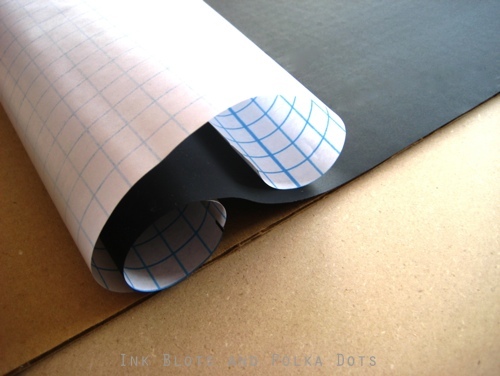 If you haven't tried this adhesive blackboard yet you should; it's great stuff! Apparently you can also get adhesive white board now too for about $4.99 at Michaels .... ah, the potential! I dug out an old gold frame that I wasn’t using and painted it white. 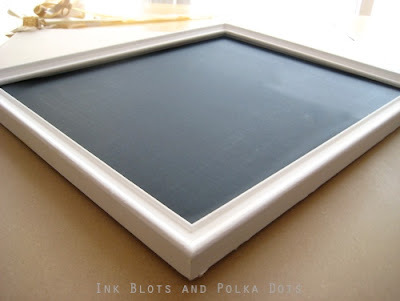 Then I cut the blackboard adhesive paper to size using the glass from the frame as a template. 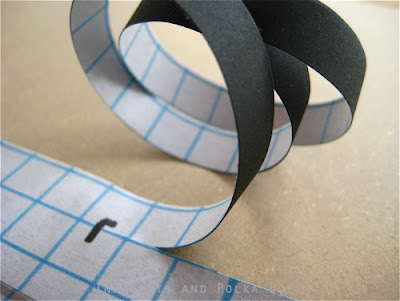 This cutting was made even easier by the grid markings on the back of the blackboard paper. 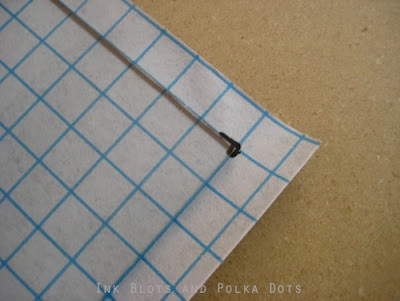 No math, no tracing … my kind of project! After cutting the blackboard adhesive to size, I carefully peeled the backing paper away and pulled and pressed it firmly to the piece of cardboard that belonged in the back of the frame to smooth out any bumps or lumps. That took all of, oh, one minute. Placing the mounted blackboard in the frame, I made small marks to indicate the dimensions of the chalkboard that would show through once framed as I didn’t want any of my quote to be covered up by the frame. Now the fun part – the lettering! I could have used chalk here but I didn’t want it to get wiped off by those little inquisitive hands, so I used a white pencil crayon for the lettering. The pencil crayon provided that streaky/distressed/chalky look that I wanted. Emulating that look with paint would have been time consuming (but definitely a medium to consider along with vinyl letters if you were going for a more “solid” look). I popped the new chalkboard message into the frame, secured the tabs in the back and voila, a simple and easy custom piece for our home. What do you think? 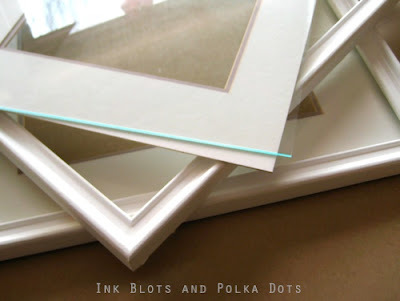 Easy and inexpensive ... my kind of art! 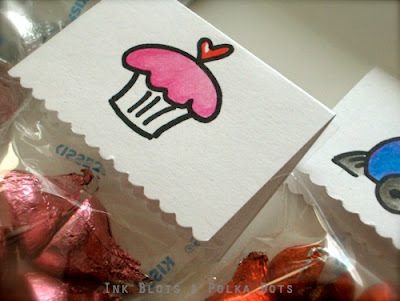 This is really cute and easy to do. . . I love it! So cute. :) It came out great! I have never seen blackboard vinyl like that... I wonder if just regular black vinyl would work? I might have to try it out. Thanks for sharing. I am your newest follower! Adorable! Love this saying. You have great handwriting! 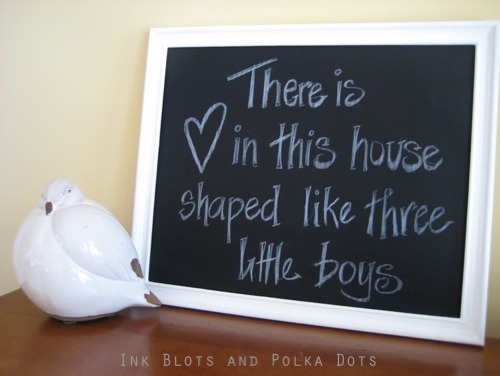 Oh, I adore your quote and it is a great piece to display for all to see......and the boys must love it, too. Thanks for sharing your idea with us.....will certainly put it to use in my home, too. 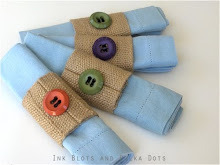 What a great inexpensive project! You have the best ideas! Oh, I am so excited to see this, I have been wanting to paint the walls in my pantry and re-organize, and this is what I need instead of painting,WHOO-HOO!! !Thanks for sharing, and you say it's at the dollar store?..that's even better, love the dollar store and dollar tree. I am new follower too! 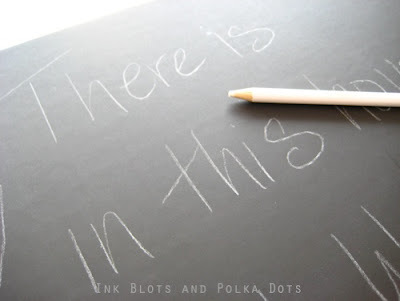 If you have a minute, visit LazyonLoblolly and tell me if I can get this blackboard paper at the dollar store? Great penmanship! Ha Haven't used that word in awhile! Just became a follower of yours! Please stop by and say hi sometime! Good job, Kristin! I love ths! Now I'm curious about what the rest of your mudroom looks like! Clever clever clever!!!! What a nifty idea, Kristin! I had never heard of vinyl chalkboard, and will now keep my eyes peeled for some! Love that quote, too! ♥ Happy MM! Wow!!! I hope to come across some of that paper!!! amazing! and simple~just what I love! Love this saying and it looks great! 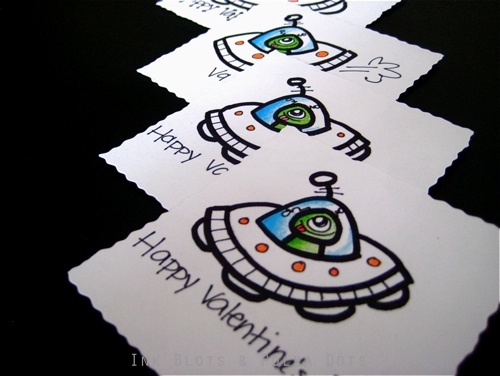 Do you mind e-mailing me the name of the dollar store that you found this awesome stuff? Wow cool! I had no idea that stuff even existed! Thanks for the tip and cute idea. oh my, who knew??? and whiteboard too? awesome info, thank you!! yours looks great! This is such a great idea! I didn't know about blackboard paper. 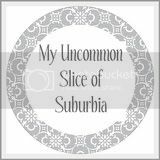 So glad I came across your blog. I'm a new follower. Oh my goodness! I didn't know you could get that stuff at Michael's or at a dollar store! I bought some from Amazon and used it on my laundry room cabinet doors! I love that stuff, and your frame turned out great! Love This! Also loving the fact that it's easy and clean! Thank you for sharing! I'm your newest follower! I'm visiting from BNOP. I LOVE this saying and your sign! Looks great and a great verse. 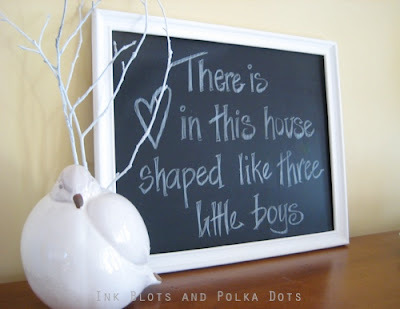 I can't believe you found the adhesive chalkboard at a dollar store. I better make sure I have a keen eye out for it at the stores I go to. So far I haven't been lucky enough to find this that cheap. I just ordered some online and I hate to think of how much more of it I would have gotten for the money if the dollar store had it! 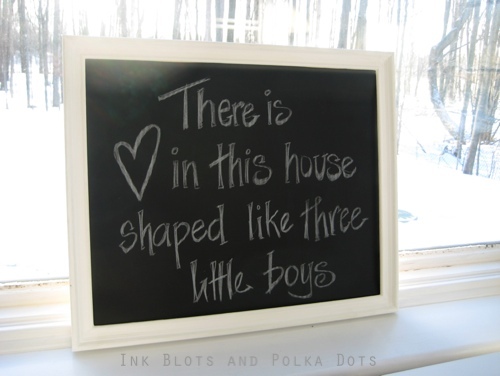 Saw you on whipperberry !I'm in love with blackboard and blackboard vinyl! Your project is great! p.s. I also just did a blackboard project! So great! I absolutely love this one. Love this. My kids want me to paint with chalkboard paint, but with a child with severe asthma I tend to want to stay far away from paint. This is a great idea. A smaller project, too! Wow! 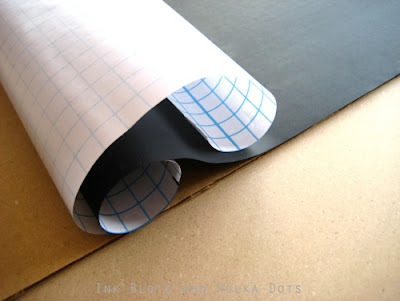 I have never heard of the blackboard paper before, but it sounds like a must try! I love the saying too. Thanks for linking up! I'm just finding out about this, I love it! Such a fun and easy project! 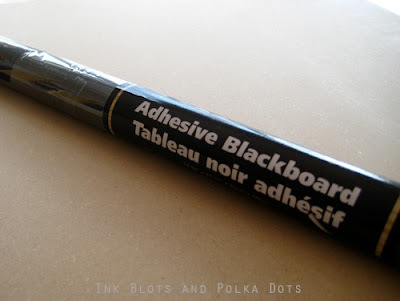 I didn't know there was such a thing a blackboard adhesive! I'll be on the look out when I'm out shopping. That quote is special...I have 2 little boys myself. Thanks so much for linking up to Terrific Under Ten! Kristin, your blackboard is featured on my blog today! Come grab an "I'm featured" button! Never seen the adhesive before. Love it! I am loving all your clever ideas here, and especially like the rice warmer bag! I would like to invite you to be a featured guest blogger at www.everydaymomideas.com. 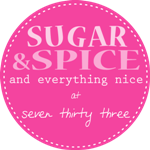 I think what your doing here is fantastic and I would love to help spread the word about your lovely blog. Just let me know if you are interested and I will get you scheduled. I LOVE this stuff! I bought it to make labels for my jars/baskets. Then I did the same thing with a picture frame for my girls' room. The white pencil crayon is an awesome idea, but I want something erasable so I can change the quote when/if I want to. This is such a simple and fun idea. It would make a great project for anyone. Would you mind if I shared this project on my blog? Got here somehow via the Drop Cloth Pillow, which led me to the ruffle pillow, which led me to this project. Great job! I just used spray blackboard paint to make a small framed blackboard for the kitchen. This looks easier and more versatile. Thanks for all the great ideas! I actually take chalkboard like you and draw things on it then leave the chalkboards around the house as decoration.